Earlier this week we published our latest 2-page WDC Insights publication. ‘Enterprise in the Western Region 2016’ analyses the latest data from the CSO’s Business Demography which measures active enterprises in 2016. This data assigns enterprises to the county where they are registered with Revenue, so if they have multiple locations (e.g. banks, chain stores) they are only counted as one enterprise in whichever county they are headquartered (often Dublin). Therefore the county data presented here measures businesses which are registered in the Western Region. In 2016 there were 54,410 total enterprises registered in the Western Region. To examine the size of enterprises, we can only consider ‘business economy’ enterprises which are a subset of total enterprises (excluding Education, Health, Arts & Entertainment and Other Services). There were 42,737 ‘business economy’ enterprises in the Western Region in 2016 and 92.7% were micro-enterprises. Roscommon (94.6%) and Leitrim (94.4%) have the highest shares of micro-enterprises in the state. Between 2008 and 2016 there was a 4.3% decline in the number of ‘business economy’ enterprises in the Western Region, compared with 3.9% growth in the rest of the state (all other counties) (Fig. 1). 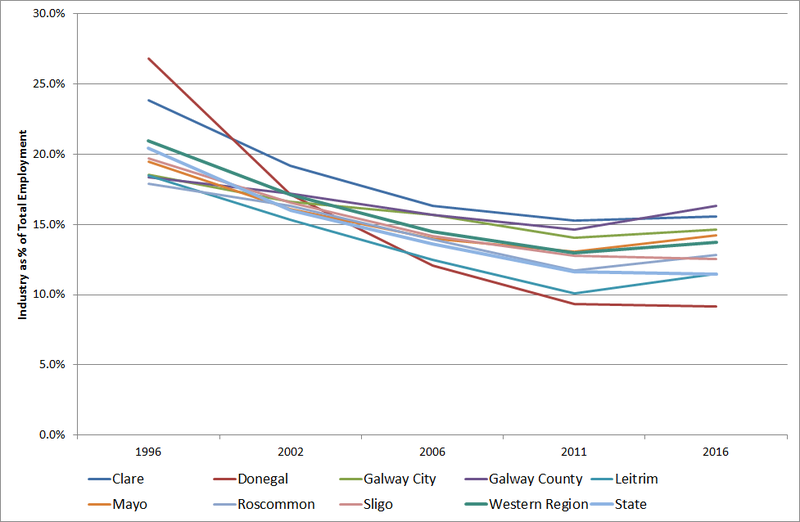 Donegal, Mayo and Roscommon suffered the largest declines in enterprise numbers over the period. The 2016 data confirms an ongoing recovery in enterprise numbers that began in 2014, with all counties experiencing an increase over that two-year period, Clare and Donegal most strongly. Although all western counties (and all but seven counties nationally) still had fewer enterprises in 2016 than they had in 2008. 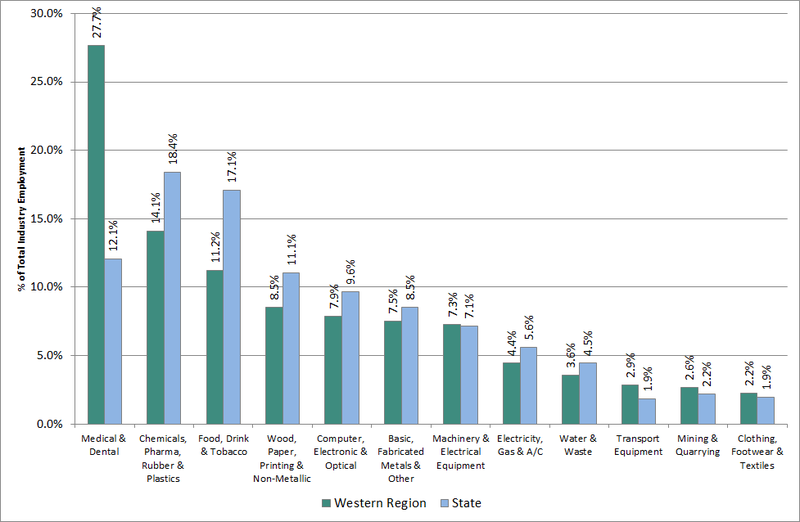 Compared with the rest of the state, the Western Region has a higher share of enterprises in traditional sectors, as well as local and public services (Fig. 2). With 1 in 5 enterprises in the region involved in Construction, it is the region’s largest enterprise sector and plays a larger role in the region’s enterprise profile. Accommodation & Food Service is another area where the region has a significantly greater share of enterprises, an indication of the important role of tourism. The knowledge intensive services sectors are of less significance to the region’s enterprise profile, with lower shares in Professional Services, Information & Communications and Financial Services. The relative importance of sectors to the enterprise profile of individual western counties varies, although Construction and Wholesale & Retail are the two largest for all counties, with Professional Services third largest for all western counties except Donegal where Accommodation & Food Service is third. As noted above, the period 2014-2016 showed growth in enterprise numbers. At a sectoral level, there was growth in all sectors in the region except for a small decline in Transportation & Storage. The largest percentage growth, albeit from a low base, was in Financial Services with an increase of 15% in the number of enterprises registered in the region, followed by Real Estate (11.5%) and Administrative Services (8%). For these three sectors, the growth in the region was higher than in the rest of the state, with the number of Financial Services firms actually declining elsewhere in that time. The region also experienced stronger growth than the rest of the state in Industry, Education, Professional Services and Arts & Entertainment. The CSO also produces data for a composite ‘ICT’ sector which combines elements of ICT hardware manufacturing with IT services, the number of ICT enterprises in the Western Region increased by 11.4% between 2014 and 2016 compared with 9.8% growth in the rest of the state. 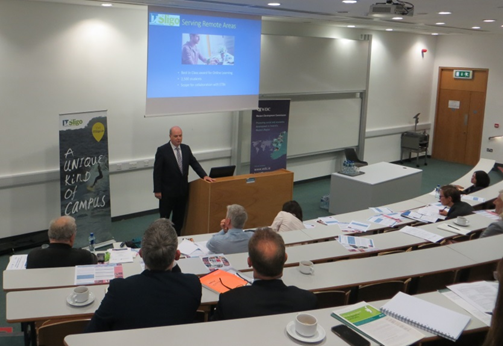 The profile of the Western Region’s enterprise base contributes to a number of the issues and challenges faced by the region’s SMEs which the WDC highlighted in its recent submission to the Seanad’s public consultation on SMEs in Ireland. See the blog post here. Download ‘Enterprise in the Western Region 2016’ here. The procurement process for the National Broadband Plan is well under way and an announcement on the preferred bidder is expected in the Autumn. It is planned that the network rollout will begin very soon after. The National Broadband Plan, first announced by Minister Pat Rabitte in 2012, has gone through a very extensive and thorough process, examining the proposed State intervention from all aspects including EU state aid rules, procurement and governance among others. It is to be hoped that all the planning, research and analysis will yield a National Broadband Plan fit for purpose for the next 25 years. The National Broadband Plan or a Rural Broadband Plan? Reporting of the NBP is often expressed in the context of delivery to rural homes and businesses. In reality it is much more than this – broadband has been and continues to be the most pressing infrastructure requirement throughout the country and there are ‘intervention areas’ across every county, including Dublin. By describing the deficit as a rural deficit it risks identifying the issue as soley a rural issue and implies that urban Ireland is well served. Take Oranmore for example, a commuter town a few kilometres from Galway city with a population of 4,990 (Census 2016). Nearly half (45.9%) of workers living there work in Galway city and suburbs while many others commute to Ennis, Limerick, Athlone and Dublin. While most of Oranmore has access to high broadband speeds, there are several housing estates which are within the Intervention area. For example, one housing estate, comprising over 40 houses all occupied by young families is situated less than 1 kilometre from the local boys national school, 1.2 km from the local Gaelscoil and 1.3km from the local comprehensive secondary school established in 1861 and catering for 800+ day pupils. The estate is on the public sewage network and on the public water supply yet has to wait for the National Broadband Plan to access fit for purpose broadband. Other housing estates situated further beyond the centre receive commercially defined high speed broadband. Many residents bought these houses in the expectation that services that are typically provided in urban settings would be available. Most residents, if not all, would subscribe to faster broadband speeds if they could and many work (or try to work) occasionally from home as some commute long distances to work. This estate is not unique, there are other estates like this in Oranmore and across the country that are in the Intervention Area. At a recent conference, Helene Graham, an independent telecommunications consultant, (previously with Eir), noted that when making the announcement in 2012, Minister Rabitte set out a plan that was going to improve telecommunications for everyone in Ireland, no matter how far and remote. At the time the target was 30Mbps download and 6Mbps upload. However the pace of change and evolution in services and technology has changed so much that as she noted there is really very little point in creating a service that gives you 100Mbps if it takes you two and a half years to build, because by the time you build it 100Mbps is irrelevant. In considering the National Broadband Plan six years ago, the Department were looking for a way to provide a long-term solution, recognising the increasing demand for greater broadband speeds. The original target of 30Mbps was to be in line with the EU 2020 Digital Agenda targets. The Department are now talking about a future proofed network, without specifying speeds, again in recognition of the ever increasing demand. This is very welcome, but will it be future proofed for everyone? The technologies and methods of rollout will have far reaching consequences for the 540,000 postal addresses in the Intervention Area over the next 25 years. There will also be consequences for new premises yet to be built in the Intervention Area over the next 25 years due to the choice of technology deployed now. Future proofing telecommunications provisions is widely considered to mean using optical fibre, which involves laying cables, often via the road network. It is accepted that not every premises in the Intervention Area will be served by fibre as it would be very costly, especially in very remote areas. What is not clear yet however is the extent of fibre/non-fibre rollout. Some suggest that about 7% of homes in the Intervention Area are too remote and will be served by alternative technologies such as fixed wireless or 5G. The final figure is likely to be the subject of negotiation with Department officials and may also change during the course of the network rollout. It will be important that the fibre rollout is as extensive and far reaching as possible given the long-term implications of the build. The National Broadband Plan is the Government’s attempt to deliver fit for purpose broadband for the next 25 years and while many have waited a very long time it is also important to ensure it is worth the wait. The Western Development Commission (WDC) will shortly publish Travel to Work and Labour Catchments in the Western Region, A Profile of Seven Town Labour Catchments (2018) which will be available for download here. In this publication, the WDC draws on Census 2016 POWCAR data to examine the travel to work patterns in centres with a population greater than 1,000 across the Western Region. 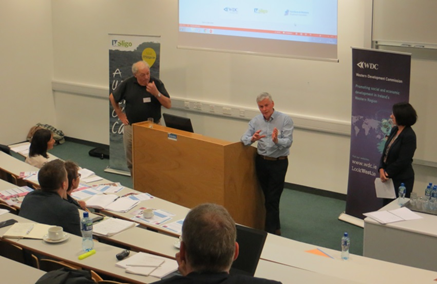 The analysis, undertaken by the All Island Research Observatory (AIRO), identifies 42 labour catchments ranging in size from the largest, Galway City, with over 70,000 resident workers, through to centres with fewer than 1,000 resident workers. The report also contains a detailed labour market profile of the principal towns in each of the seven counties of the Western Region, namely: Galway, Ennis, Sligo, Letterkenny, Castlebar, Roscommon and Carrick-on-Shannon. Trends are also examined, drawing on the original travel to work analysis based on Census 2006 conducted by the WDC. All seven town labour catchments have significantly more people at work than the resident population of workers in each town as identified in the Census. They therefore have access to a larger labour supply. For example, Galway city labour catchment has a population at work more than double the Census population of resident workers, while Carrick-on-Shannon labour catchment has a population at work approximately 4.6 times the population of resident workers. Compared to a decade earlier the seven county town labour catchments account for an increase of only 0.5% in the to­tal share of the population at work and living in the Western Region. This shows the limited change that has occurred over a long period and the need for very strong policy intervention to effect change. The analysis highlights the importance of rural areas (centres with less than 1,000 persons) as employment locations. Generally over one fifth (in excess of 22%) of those living in the town labour catchment are employed in rural areas. The highest level of rural employment is in the Ennis labour catchment with over one quarter (26.9%) employed in the Clare rural area. North-east Donegal is strongly linked to Northern Ireland. The ‘Derry Rural’ labour catchment accounts for over 5,000 resident workers, an increase of approximately 10% since 2006. This region will be most impacted by BREXIT, therefore policy needs to be developed and implemented to mitigate the impacts. (i) the full report, provides an overview of the travel to work analysis, identifies the 42 labour catchments, and provides an overview of change between 2006 and 2016. It contains the detailed labour market profile of the principal towns in each of the seven counties of the Western Region (Galway, Ennis, Sligo, Letterkenny, Castlebar, Roscommon and Carrick-on-Shannon). (ii) Individual bulletins containing only the labour market profile of the principal towns are also available. These reports will provide information for prospective employers, develop­ment agencies and regional and local authorities. 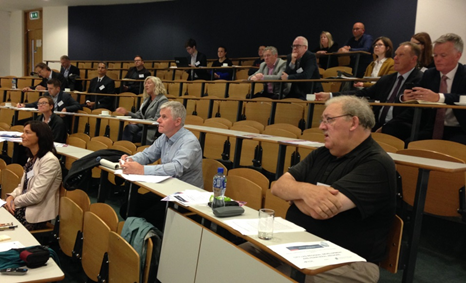 These data can also be used in determining catchments for various services which will be of interest to transport providers, planners and local authorities. 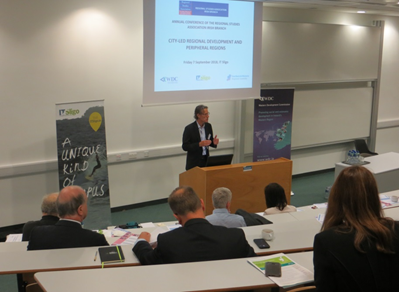 The outputs of the report will also be a useful evidence base for researchers and planners en­gaged with the Regional Spatial and Economic Strategies (RSES) for both the Northern and Western Region­al Assembly (NWRA) and the Southern Regional Assembly (SRA) and also for Project Ireland 2014, the National Planning Framework (NPF).